Australia's army will be given greater powers to act during an terror attack under proposed new laws. The announcement follows a review of security forces' responses to a series of incidents in Australia and abroad - including the 2014 Sydney cafe siege. Prime Minister Malcolm Turnbull said the army will be able to intervene as soon as a "terrorist incident" has been declared. Currently, it has to wait until police conclude they can no longer deal with the situation. Specially trained officers will also be embedded into local police forces to aide coordination. Speaking on Monday at Holsworthy Barracks in Sydney, Mr Turnbull said: "Our enemies are agile and innovative. We have to stay ahead of them. 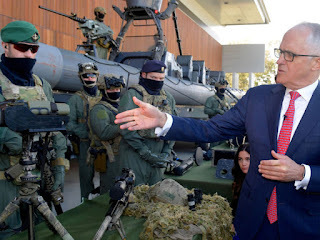 "We have to ensure that every resource we have - legislative, military, police, intelligence, security - is always at the highest standard and able to be brought to bear to keep Australians safe." He also praised British police's response to the London Bridge attack, in which two Australians were killed. "It is vitally important that front line police have their skills improved to be able - and the training to be able - to deal with these incidents on the spot," he said. Mr Turnbull added that police will remain the first responders but the changes will allow them to work more closely with the army.